Buy a DeskRoll Pro license with 2+ seats (buy now). 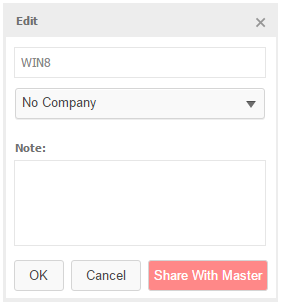 Add user(s) to your Master account (explained here). In your Master account, open Computers. Click Access... on the desired computer and you will be able to choose from 3 options:. 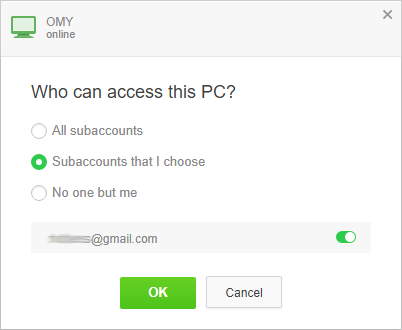 All subaccounts – share computer to all subaccounts. Subaccounts that I choose – select subaccounts from the list. No one but me – the computer is accessible from your account only. In your Sub-account, open Computers. Click Edit... on the desired computer and then click Share with Master. Now the Sub-account still has access to that computer, but Master can edit or remove it or share it with other Sub-accounts. Master's DeskRoll Pro license covers all its Sub-accounts. Computer sharing is only available for unattended access hosts (Computers tab), not ad-hoc support (Clients tab). Each Client can be linked to multiple DeskRoll accounts, though. Thus, one computer can be accessible from multiple DeskRoll accounts. Note that at any given time, only one DeskRoll account can do a remote control session with such shared computer.